Trade in style for substance, and you'll get far better fitness trackers at a similar, or better price than the Huawei Fit. If, like many, you're thinking along the lines of "new year, new you" then a decent fitness tracker such as the Huawei Fit is probably atop your 2017 gadget wish list. Getting the right one can be the difference between hitting that 10k personal best, or giving up on your latest fitness kick before January is even out. The Huawei Fit is a recent device in this bulging market. Packing traditional fitness tracker skills into a more sports watch-style design, it faces-off against the likes of the Fitbit Charge 2 and TomTom Touch for a spot on your arm. Capable of tracking everything from your steps and sleep, to run distances and calories burned, the Fit - which also brings call and message alerts direct to your wrist - plays nice with both Apple iOS and Android devices. So far, so good then, but does the Huawei Fit do anything to separate itself from the masses? We put it to the test to find out. Fitness trackers aren't always the best looking bits of kit. Actually, they're often a bit bland and boring looking. The Huawei Fit though certainly looks the part. Styled like a traditional watch, it's slick, round, button-free body gives it a clean, unassuming look that's suitable for everything from a day in the office to a night out on the town, via that lunchtime gym session. Unlike a lot of fitness trackers, this design doesn't scream for attention, either. People won't even know you're wearing a fitness tracker unless you tell them - saving you, and those around you, being subjected to endless, unsolicited chat on running routes. The Fit's slim metal body is practical as well as pretty, squeezing in impressive waterproof skills. It's not just a run in the rain or a post-gym shower that the Fit will survive, either. Waterproof to 50 metres, you can take it along for your next trip to the swimming pool too. Available in a trio of colour options, the black on black model we tested is the most understated. Elsewhere, the silver body with either blue or orange straps offers a more sporty, outgoing style. Want to switch things up? Fine. Those rubberised waterproof sports straps are interchangeable, letting you customise what is already a comfortable, lightweight fit, even when embarking on long runs. Unlike devices such as the Apple Watch or Suunto Spartan Sport, the Huawei Fit doesn't offer a colourful OLED or LCD display. That doesn't mean it's missing touch-friendly controls though. Not only does the its monochrome Memory LCD display let you swipe through a number of screens to navigate your way to your daily step count or calories burned, it's down to this touch panel to front all of the interface interaction as there are no physical buttons. Unfortunately it's not really up to the task, as the touch elements are temperamental at best. Swipes are all too regularly read as presses and presses blanked completely. There's not much finesse to this screen. Throw running into the mix and trying to scroll through your real-time data is all but impossible without first slowing your pace. It's not all infuriating misery though. On the up side, this 1.04-inch panel creates a device that's easy to view without dominating your wrist. The always-on screen makes checking the time and current steps count a breeze, and the auto backlight and ambient light sensor are smart to your surroundings. No, the 208 x 208 pixel (200ppi) display isn't the sharpest, far from it, but that doesn't really matter. It displays all your live run data in an easy-to-read but far from inspiring fashion. It's a bit dull and lifeless, yes, but the Corning Gorilla Glass 3 coating does ensure the watch will stand up to all the knocks and scuffs that it's likely to face when chucked into your gym bag or when running through the woods. Want to track all your activity be it walking to the shop or running a half marathon? No problem, that's what this watch is for. At least that's the theory. In practice, however, the Huawei Fit is about as successful as your plan to completely avoid booze and burgers for the next 12 months. On paper it might tick all the right fitness-tracking boxes, but start pounding the pavement and things all too regularly come up short. Accuracy is its big issue, with the watch's lack of integrated GPS costing it big when it comes to data you can trust. 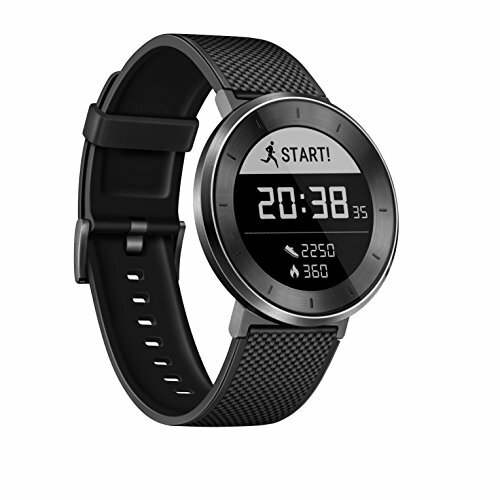 Despite using a similar 6-axis accelerometer and gyroscope sensor pack to many more accurate trackers, the Huawei Fit's fitness tracking is all over the shop. Walk down the road and it's too generous with its step count; start running and it becomes particularly stingy. Overall, it's consistently about 10 per cent off in terms of accuracy, underplaying the true distances of your runs. Hold your phone or water bottle in your watch-accented hand while running and these accuracy shortcomings are further exaggerated. When you're covering distances of 10k or greater, that's a huge, energy-sapping discrepancy. It's not just your distance that this affects either. It throws all of your data off and underplays your improving fitness levels. This alone is reason enough to avoid the Huawei Fit. Sadly, however, it's not the watch's only issue with accuracy. The device's integrated heart-rate sensor, slotted on the underside of the metal bodied watch, is poor. Heart rate readings are consistently too high, warming us we're in dangerous levels while only enjoying a casual jog. While your resting heart rate will display as a little on the peaky side, start training and it quickly shoots off the chart. Worn at the same time as both the Apple Watch Series 2 and Garmin Forerunner 35, the Huawei Fit's heart-rate sensor was at times 40 points higher than its rivals. Notifications aren't much better, either. Despite coming through just fine, they're not particularly pleasant to read, with large, blocky text forcing you to slowly read word by word. It's quicker and easier just to get your phone out of your pocket, and sadly this flawed system is just the tip of the Fit's software shortcomings. Any fitness watch is, to some degree, only as good as the software and app that power it. Sadly, the Huawei Fit fails to inspire. It's competent enough at displaying your fitness data - however skewed it might be - but it doesn't really build on the core foundations. Yes, the app lets you create your own training plans, but there's no smart coaching element here to tailor the plan to your goals, improve fitness levels or guide you through your next training session. Instead of turning your data into a tangible, meaningful insight, it simply spews it at you in a variety of charts and graphs that on their own fail to show you how to improve. Navigating your way through these is a laborious chore, too, with no fluidity to the app's layout. It's an uninspired, unoriginal approach that already feels dated. And that's assuming you can get the app to sync. Despite having the watch and phone connected - call notifications were coming through fine - watch-based fitness data often refused to transfer during our testing. Citing connection issues, we regularly had to re-sync the watch just to see how far we'd run. Worryingly, the watch's onboard software is even worse. It's clunky, awkward and - short of displaying a large ‘Start run' button front and centre - does little to encourage you to get active and pursue your latest fitness goal. Live data is in short supply too. You can see distances covered, time run and calories burned, just not all at the same time. Instead, you've got to swipe through the real-time stats, something that's not exactly with this screen when you're bobbing along at a steady pace. Fiddly to navigate with an Android Wear-style up, down, left right swipe interface, even the software's better ideas are executed poorly. Having your heart rate intensity highlight when you're in the prime fat-burning zone is a great idea, but the watch's woeful heart-rate sensor readings mean this addition is essentially redundant. Thankfully there are positives. Accurate fitness tracking might not be this wearable's strongest suit, but it's not a watch that's all doom and gloom. There are a few plus points, and, like it's design, the watch's battery life is another highlight. You'll get a full working week between charges. This isn't just five days stuck to your sofa measuring little more than your hourly trips to the fridge, either. Throw some daily runs or serious walking sessions in and the watch will still be proudly displaying the time come the end of the week. However, while this is nice, we'd really rather have a three day battery life and power-sapping GPS thrown in to provide more accurate run tracking. If you're looking to get active, and, more importantly, stay active in 2017 and beyond, the Huawei Fit probably isn't the fitness watch you're after. Yes, it looks great and the battery life lasts an age, but that's not enough to compensate for its disappointing step, run and heart-rate accuracy. Little more than another "me too" device, the Fit is slow and clunky, while the app (although easy on the eye) does little to translate your fitness data into meaningful health-improving guidance. Trade in style for substance, and you'll get far better fitness trackers at a similar, or better price. The Charge 2 might not look as good as the Huawei, but it's got it comprehensively beat in every other department. If you really covet a good-looking fitness tracker, then the Withings is more accurate than the Fit while remaining easy on the eye. There's also a heart-rate model coming out too.